A couple of culinary things are a given in my house. One is that, every two or three weeks, I will eat roasted chicken for dinner with good crusty bread and a green salad. The other is that I will turn the leftover chicken into chicken salad. Note that I didn't say I will roast a chicken every two or three weeks, just that I will eat one. Oh, I've roasted my share of chickens and still do on special occasions. But what I love about this particular dinner is that it's quick and easy and that means store bought rotisserie chicken. Those things are so good! I usually behave and pull off most of the skin to make it a pretty healthy meal. It's also a meal that must be eaten while being stared at intently by my dog but that's another story. Now, about the leftover chicken, because there certainly will be a fair amount of it. That is my built-in excuse to make chicken salad for lunch the next day, and quite possibly dinner as well. So before I put away the first night's chicken dinner, I disassemble it and stash it in an air tight container in the fridge. I prefer to shred the meat rather than cube it but that's a personal preference. A standard deli chicken salad has mayonnaise and celery but I see it as a blank canvas for lots of flavorings. Here I went Middle Eastern with tahini and za'atar. You can still add celery if you like but I got the crunch from carrots and almonds and it was so good! Make the tahini sauce by combining the garlic, sesame paste, lemon juice, Greek yogurt and water in the bowl of a small food processor. Puree until fully combined and season with salt and pepper. Remove the skin from the chicken and shred or dice the meat. Add the chicken to a large bowl along with the shredded carrots and toss with the tahini sauce. Stir in the sliced almonds, chopped cilantro and za'atar. 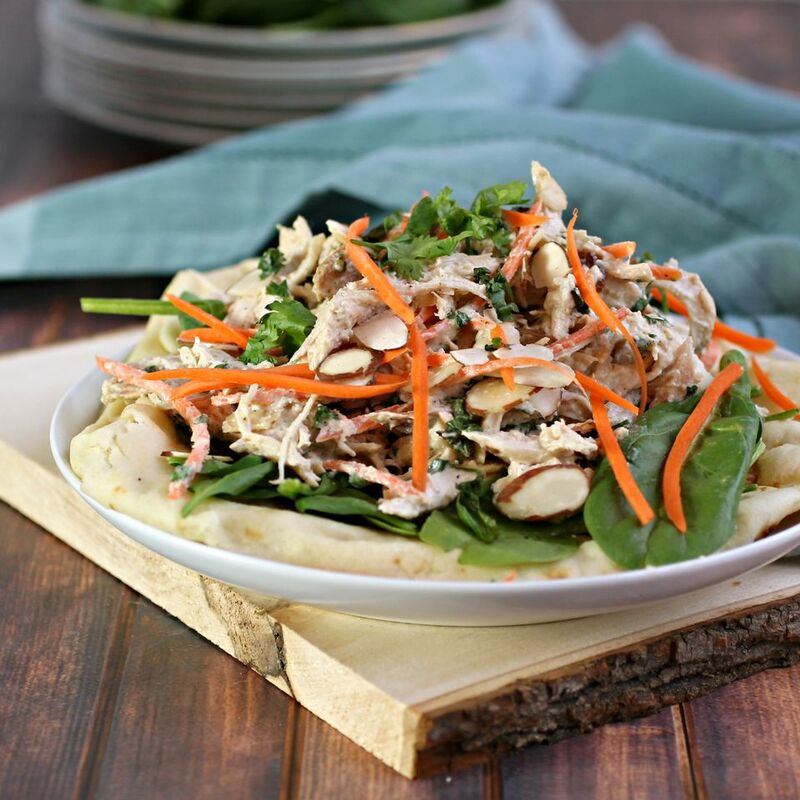 Serve on pita or naan bread with greens such as baby spinach.